Our Magner 4-in-1 basic currency authenticator (Mag II) is economical and effective. A reliable alternative for determining the authenticity of banknotes, credit cards, traveler's checks, IDs and most driver's licenses. The Mag II has both ultraviolet and white fluorescent lamps that aid in the verification of flaws which are difficult to detect with the naked eye. This unit has a 12 watt overhead UV lamp and a white fluorescent back light. Yes it looks quite like a tanning bed but Its small footprint is 11 inches W x 6 inches D x 5.7 inches H. Works best when located away from direct or bright light sources. 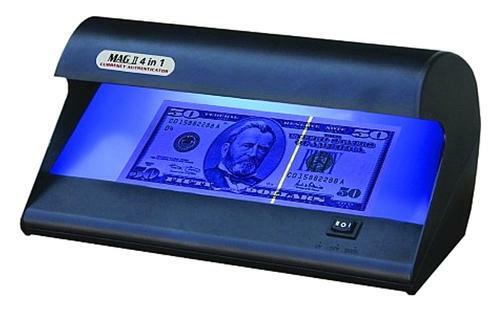 Our Magner 4-in-1 basic currency authenticator (Mag II) is economical and effective. A reliable alternative for determining the authenticity of banknotes, credit cards, traveler's checks, IDs and most driver's licenses.